21, Quinta da Aldeia, Figueira is located in the unspoilt Costa Vicente nature reserve and adjacent to the Parque de Floresta golf course. This is a very well furnished house sleeping up to 6 people situated in a prime position in a small, attractive development built in the mid 90´s and now benefiting from beautiful mature gardens that complement the pretty pool area. We are fortunate to be one of the few houses with private parking. The ancient village of Figueira is on the doorstep with an excellent restaurant and the fishing village of Salema 2km. away. The coastline here is unspoilt and there are many beaches of all sorts; large, small, sandy, rocky, cliffs, surfing,swimming, water sports within minutes by foot or car.Parque da Florest golf course is adjacent, with discounts available, and offers tennis, lawn bowling and a spa and leisure centre in addition to the beautiful and challenging golf course. Beautiful cliff walks, wonderful flora and birds. We hold the AL licence required by law for rental properties. and only awarded after rigorous scrutiny . NB. British TV programmes are received through the internet; we are therefore not affected by the discontinuation of the satellite which will mean that many houses will lose their UK programmes..
Stairs lead up from an entrance hall to a light, spacious living/dining room. Large windows afford a wonderful view over the garden and village roof tops to the rolling countryside beyond which lies the sea, a mile away. A French window opens onto a south and west facing paved terrace with barbecue. External stairs go down into the attractive, private garden with lawn, flowers (and its own lemon tree) and a further paved dining area. The living room has a very efficient log burning stove for cooler days and has a TV, (see above) video. DVD. and CD./radio. The fully fitted kitchen leads off the living area and looks over the pool and gardens at the front. It is equipped with an oven, hob, microwave, toaster, dish washer, fridge/freezer and washing machine/tumble-drier. There is also an upstairs cloakroom with WC and basin. Downstairs, the 2 double bedrooms have sliding windows giving access to the garden. The master bedroom has an en-suite bathroom and there is also a house shower room with huge shower, basin and toilet. Both bathrooms have been fully refitted. The 3rd bedroom is a generous sized twin and looks onto the front gardens. The house is furnished to a high standard , fully double glazed and the bedrooms have air conditioning. PLEASE NOTE The satellite that provides BBC and ITV here in the Algarve will not be available 2014; many houses will have no British TV. We have TV through the internet. Myself, my wife and the in-laws spent 2 relaxing weeks at Penny & Nicks beautiful villa & we would all thoroughly recommend it to anyone who is seeking a relaxing vacation in wonderful surroundings. The villa itself is perfect with all the amenities that you could ask for, but the cherry on top is the wonderful views over the surrounding countryside from the first floor terrace at the rear - perfect for watching the sun go down in the evening with a glass of wine in hand or to soak up the afternoon sun. The village of Figuera (which is a short walk from the villa) has a couple of bars - one which does tasty snacks & pizzas - & a restaurant called O'Sapinho which serves excellent food at very reasonable prices, but make sure to book a table in advance as it is only small & fills up quite easily. There is a small fishing village named Salema about a mile & half away that has about half dozen restaurants & a couple of bars, not to mention a lovely beach that is nice to take an evening stroll along but it can be a bit difficult to find a parking spot especially in peak season, although there is a decent sized public car par on the way in to the village. If you want a bit more life then the town of Lagos is about a 20 minute drive away & there you will find plenty of shops, bars & restaurants as well as a market. It was our first visit to the Algarve & we all thoroughly enjoyed our stay & would recommend it to anyone who is looking for a switch-off-&-relax holiday in the sun. Thank you for finding the time to write a review of your holiday in our house. We are so glad that you enjoyed it and found everything to your liking.You are right; that view from the terrace is so beautiful. You obviously explored the area and it sounds as if you came to like it as much as we do; it's a very special part of the Algarve. Very comfortable time. Very quiet and suitable for both the adults and grandson. Very nice property, garden and communal swimming area. Well positioned for the surrounding town of Lagos and beaches. Thank you for taking the trouble to write a review. We are very glad that you enjoyed your holiday and found the house and situation well suited for your needs of young and old(er). ..And thank you for watering the garden! Our holiday in 2013 was so good we had no reservations about returning to the same Villa in the same complex on the outskirts of a sleepy village in the Western Algarve. There have been some changes to the Villa since last year which includes, some new double glazing, speedy broadband and a very good quality flat screen television along with a device to ensure that you get all of your favourite TV channels. If the weather is unsettled and the beach or sightseeing is an unlikely prospect you will find that the villa has a good selection of books, dvds and games to keep people of all ages entertained. The booking process was effortless and the owners are always available to provide information. Once again there was a survival kit waiting for us, bread, butter, milk and a grand selection of teas and coffee, all very welcome as it allows you to relax and think about what shopping you need to purchase rather than rush out and do a trolley dash. Eating out is always nice here, there are a couple of restaurants in the village and close by is Salema where there are numerous restaurants to choose from. It is not too far to walk to Salema and is advisable if you intend to have some of the excellent local wines. On the return journey climb the hill out of the village at a leisurely pace it’s not as tough as it looks and if you are visiting in the evening a torch would be a sensible precaution. If you are dining at home the Villa has well equipped kitchen or a BBQ to prepare your meal on, with local shops and supermarkets close to hand you won’t go hungry. Dining at home on the roof terrace watching the sunset over the hills is an absolute must. Our thanks again to the owners for allowing us to share their home and thanks also to their site manager who promptly answered our call regarding the safe. I have to say, this holiday location is habit forming. Thank you Derek for your positive comments.We are delighted when guests return and love our house and the area as much as we do. Keep up the good habit! 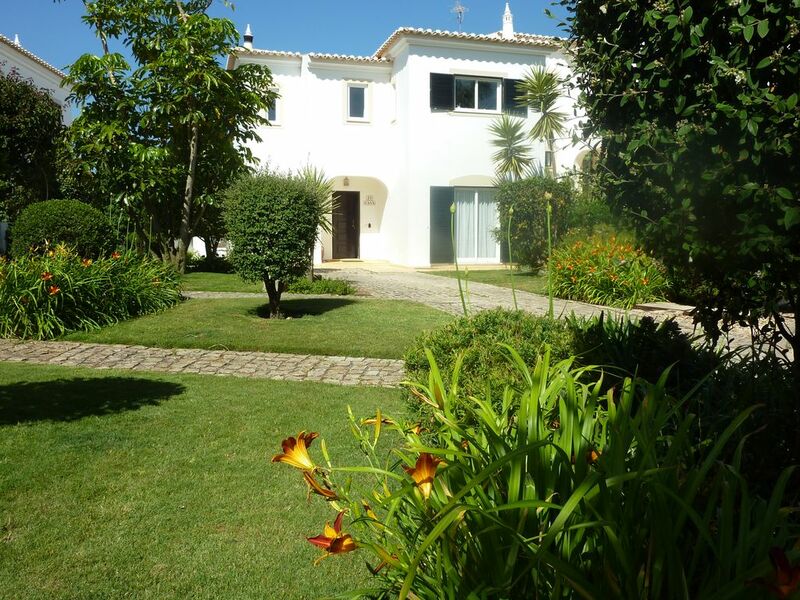 Our Villa was situated in a small complex on the outskirts of a sleepy village on the Western Algarve. The complex of around 30 properties encircle a private swimming pool which is solely for the of Villa owners and their guests the gardens and properties are immaculate and well maintained. The Villa, which was exactly as described on the Web Site, was the ideal location to celebrate our 40th Wedding Anniversary, however, a word of warning, this Complex and Villa was so comfortable you had to coax yourself to get up and venture out to see the surrounding countryside. If you don’t you will miss places like Monchique, the town and the Spa, then there is Sagres, Silves , Lagos. Didn’t find a bad beach at all they are all good in their own way and if you don’t mind a bit of drive go to Odeceixence the village is quaint and the beach is excellent. The owners thoughtfully provide a survival kit comprising of Tea, Coffee, Bread, Butter & Milk to get you through the first night. If you contact the owners prior to departure they will also arrange for additional items to be left, a very useful service if you know that your inbound flight is scheduled to arrive late in the evening. The village has several restaurants which are less than 5 minutes away from the Villa alternatively you can drive down to Salema for a wider choice. Whatever you do don’t overlook the facilities at the Villa, the elevated terrace for Al Fresco dining (what a view) the well equipped kitchen and BBQ The are a couple of village shops selling groceries etc and you are a short car journey away from Budens where there is a supermarket. Derek, Thanks so much for your enthusiastic and kind words. We love it when our guests make the most of the area and discover this beautiful unspoilt place. But you're right : sitting on the terrace and soaking up the view is a bit special with a glass of the very good (and cheap!) local wine. We hope you will come back and try some more! HIGHLY RECOMMENDED! BEAUTIFUL VILLA AND VILLAGE! Lovely home, exactly as described in the advert! It really is a home away from home. Everything you could possibly need is provided – cooking utensils, washing machine/dryer, area travel guides, reading books, dvds, board games!! Not to mention the welcome hamper you are kindly provided with. The pool area is very relaxing and blissfully quiet and the villa terrace looks over wonderful view of the hilly landscape, which provides a beautiful sunset, as well as sunshine all day! The beack which is a short walk away is beautiful and fairly quiet. The village itself is small, quaint and locals are very welcoming. The local restaurants are excellent value as is the wine. However, it is very small so a car is highly recommended so you can travel to nearby villages if you would rather not walk in the heat. Salema is worth a visit, busier than Figueria but more choice of restaurants, shops and bars. More beaches too, although busier. Lagos is a short drive – 20mins – and there is so much to do there in terms of trips, shops, markets that it would keep you busy for hours/days! Worth visiting but definitely a lot busier and faster paced. It was lovely to visit but even better to know we could return to Figueria for some peace! Highly recommended for a blissful, relaxing holiday. Very clean and tidy with supermarkets, beaches and villages all nearby – what more could you need! Thanks for the review Christa. What you have said encapsulates what we feel about the area and what we try to provide, so it is very good to read your reaction and feedback. We certainly agree that a car is advisable as without independent transport it is harder to find the wonderful selection of beaches nearby , let alone the restaurants! Excellent séjour dans une maison très agréable, bien équipée et très au calme. La réservation et la gestion de la location se sont très bien déroulés par échange de mail et virement bancaire. La caution nous a également été retournée rapidement par virement. Thank you. As we are not divers, it is good to hear what a good diving destination it is. We loved receiving the photos of the aquatic life you saw! We do try to respond to all e-mails promptly and efficiently. Figueira. Our complex is on the edge of this small ancient village of narrow cobbled streets and brightly coloured houses. There is a small shop where basic groceries can be bought and a restaurant where you can eat well and inexpensively within 5 minutes' walk. Lagos is 10 miles to the East where there is the old slave market, marina, harbour, fish market, and a great range of shops and restaurants. Local crafts include pottery and lace and provide interesting shopping. The price is all inclusive. The house is prepared for your arrival with a small welcome pack. We do ask that it is left in a reasonable condition and that visitors respect that it is our home for several months .